We’d love your help. 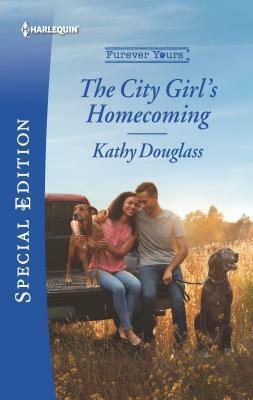 Let us know what’s wrong with this preview of The City Girl's Homecoming by Kathy Douglass. Megan Jennings just found the ideal temporary home for sixteen suddenly displaced pets. Too bad the farm’s owner isn’t giving the two-legged, former New York attorney the same warm welcome. A city girl broke Cade Battle’s heart and no way the gun-shy cowboy’s trusting in the feelings Megan awakens. But after being orphaned as a Eight dogs, eight cats…and one ornery cowboy! To ask other readers questions about The City Girl's Homecoming, please sign up. Kathy is a born reader who as a child always had her nose in a book. That love of reading grew with her. She often would finish one book and immediately pick up another. She went from reading Bobbsey Twins to long, lush romance novels. One day she stumbled upon the Shining by Stephen King and was hooked. She turned her back on romance and became a serious Stephen King fan, reading every word he wr Kathy is a born reader who as a child always had her nose in a book. That love of reading grew with her. She often would finish one book and immediately pick up another. She went from reading Bobbsey Twins to long, lush romance novels. One day she stumbled upon the Shining by Stephen King and was hooked. She turned her back on romance and became a serious Stephen King fan, reading every word he wrote. When she caught herself checking under the bed and looking in the closet for monsters or worse, she knew it was time to put down the horror stories and pick up the romance novels. All too soon her kids were attending pre-school two hours a day. She spent those few precious renewing her relationship with romance novels. After a while she felt the urge to write a book of her own and she began writing the stories she wanted to read. She spent many years writing some really terrible books and learning her craft. In 2014, Kathy participated in Brenda Novak’s online auction to raise money for a cure for Diabetes. She was the highest bidder for a critique by editor, Charles Griemsman. He did not buy that book immediately, but requested another which became her first book in the Sweet Briar Sweethearts series.